Contemporary pictures by several artists comprise part of our stock, and subjects are representational in nature. The greater part of this section is made up of paintings by Philip Davies. Philip Davies is a resident of Swansea, born in 1946. He studied at Swansea College of Art, and University College, Cardiff, and pursued a career in graphic design until 1992 when he became self-employed, and Philip Davies Fine Art was established in a full time capacity. Since 1995 his paintings have been selected for exhibition by the Royal Watercolour Society, Royal Society of British Artists, Royal Society of Marine Artists and the Royal Hibernian Academy, Dublin. His work has featured in one-man and joint exhibitions. 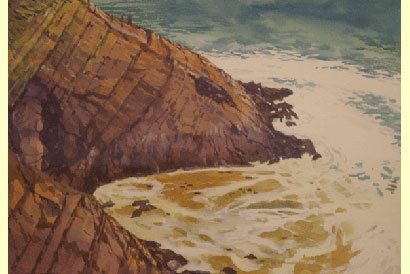 Philip is a member of the Watercolour Society of Wales, and when resident in Ireland (2000-2003) was elected to membership of the Watercolour Society of Ireland. Framed work is priced at £300 – £550 depending on size. Philip undertakes commissions and would be happy to show you current and past work and see if it suits your requirements in terms of style and price. To discuss your needs, please contact us.